New Delhi-based entrepreneur Ankit Oberoi has been launching Internet startups for nearly a decade. Like many entrepreneurs, Ankit wears many hats; he describes himself as a programmer, online marketer, webmaster, and growth hacker. His current venture, AdPushup is an A/B testing tool for Web publishers. He has graciously agreed to take some time to share his thoughts on entrepreneurship and Web revenue monetization. This article is one in a series of interviews with Web monetization experts. Check out our interview archive for more interviews like this one. MonetizePros [Jimmy Atkinson]: How and when did you get your start with making websites and starting Internet-based businesses? Ankit Oberoi: It was back in the year 2004 when I started my first business. This first venture was a Web hosting company, which I bootstrapped and grew to about 500+ customers and at one time hosted more than 10,000 websites on my servers. It was a great experience and taught me a lot of lessons about online marketing and SEO. We were only using inbound marketing to generate business. Around the same time, I also took interest in creating and monetizing websites using AdSense. Pretty soon, I was running multiple websites (niche based, user generated content) with AdSense, and within a few months, these websites became quite profitable. MonetizePros: What other projects have you worked on before launching AdPushup? Ankit: After I sold off my Web Hosting Company in 2007, I co-founded Innobuzz with my partner, Atul Agarwal. Atul at that time was also developing and running multiple user-generated content based fansites and monetizing them through multiple channels, including affiliate networks and AdSense. At Innobuzz, we’ve built a lot of Web-based applications together, primarily focused on Information Security, and this experience in Web app development is definitely helping AdPushup, which happens to be my third venture. MonetizePros: By the look of the AdPushup homepage, you place a lot of value on different Web tools designed to help a website owner extract the most value from his/her site. What are your favorite tools that any website owner trying to monetize a site should be using? Ankit: The current situation is that the ad networks themselves do most of the work, when it comes to ad revenue optimization. These networks use a lot of technologies (contextual, behavioral targeting) to make the ads more personalized and targeted, helping improve the CTR and eCPM, for publishers. So, the problem is that very few publishers actually use tools and testing to optimize their revenues, assuming that the ad networks are doing the optimization for them by making the ads more relevant. However, the truth is that there are various important attributes and elements which are beyond the control of a network and only a publisher can optimize these elements (such as the ad location, size, and theme). Some tools, which can really help here, are heat maps (Crazy Egg) and attention maps (EyeQuant). These tools can help a publisher get a better view about what his readers find interesting and then help him place the ads, close to such interest spots. We’ve used them and found them to be effective. Another popular technology called A/B testing is very effective at helping improve ad revenues. The only issue however is that the currently available A/B testing tools can’t be directly used to measure results, out of the box. MonetizePros: Let’s shift gears for a moment. Besides computing, what other hobbies do you have? Anything of interest? 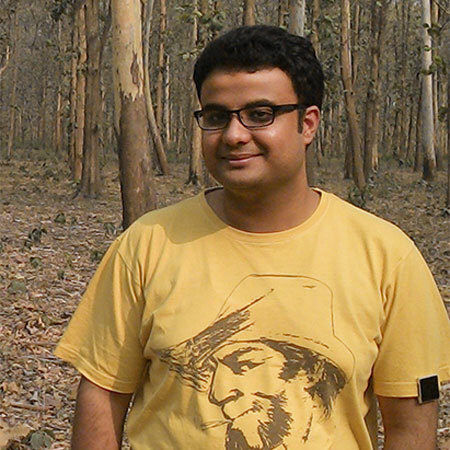 Ankit: I love exploring different cultures, food and learning new languages. I also enjoy hiking and short backpacking trips, especially in the Himalayan region of India. MonetizePros: Back to business now. What is the single most important piece of advice that you would give to any small blogger or Web publisher wanting to monetize a site? Ankit: Make sure you’re focusing on creating a readership or subscriber base for your website. Repeat visitors help you earn more ad dollars in the longer term. MonetizePros: Tell us a bit about your new product, AdPushup. What is it designed to help with exactly? At AdPushup, we’re building a product, which utilizes a multi-armed bandit problem approach (similar to A/B testing, but much more efficient and perfect for this use-case) to optimize ad revenue. Over the last 3-4 years, the A/B testing and general CRO market has grown rapidly. However, the focus has been largely on advertisers and marketers who aim to optimize their websites or landing pages by improving their conversion rates. The publisher segment could never benefit from such tools due to technical limitations and especially since the creators of such tools never focused on publishers. Although, our product is not in public beta yet, but we’re currently using AdPushup on some websites, which use AdSense and the results so far have been astonishing. Most of the websites have reported anything between 30-120% rise in their ad revenues. The approach is similar to A/B testing but with one major differentiation: it features continuous optimization (based on machine learning). In simpler terms, optimization is a continuous process and our product will constantly measure the performance of your ad units. As soon as it notices a change in user behavior towards the ad units, it will automatically find the new best ad location, theme, and size to keep your ad revenues up, all the time, without any manual intervention. MonetizePros: With the 30-120% revenue increases that you’ve experienced in your alpha testing, what has been the primary cause of these increases? Have the increases been due mostly to optimizing location of the units, or changing the size of the ad units, or increasing the number of units, or all of the above? Or perhaps another factor? Ankit: The primary factor which has resulted in major rise in revenue is the ad Location. The location has played a very important role. Similarly, ad size and the unit’s color theme have also increased revenues considerably. For example, on one website, just by blending the ads with the website background color, we witnessed a 75% increase in CTR. It is also important to note that we’ve always kept three ad units per page in all our experiments, so the effect of change in the number of ad units has not been tested yet. MonetizePros: What will the AdPushup implementation be like for publishers? What specifically will a publisher using your product have to do? Is it merely a few lines of code on each page or something more involved? MonetizePros: Who do you expect will want to sign up for AdPushup? Who is your target audience? Ankit: Our target market is quite huge. All website and blogs who serve CPC based ads and wish to improve their ad revenues, can signup to try our tool, once we launch. We look forward to a public beta release within a couple of months. To summarize the product for publishers: AdPushup will help you make more money from your website, with the same traffic. All it requires is a half-hour, one time setup. That’s it! MonetizePros: What do you envision for yourself and your company in five years’ time? Ankit: Five years is too long! We are very excited about the coming five months! Our public beta is coming out soon, and we are confident of it reaching 500+ paid users shortly after that. Since our product directly impacts the webmaster’s profits, the product adoption and cost-benefit analysis will be very straightforward and favorable. We have a lot of features lined up that we’ll roll out based on the user feedback and adoption. It’s an exciting time for us! MonetizePros: Thanks for taking the time today, Ankit. Best of luck with AdPushup. I’m looking forward to trying it out myself! Thanks! We look forward to your feedback when we make the beta version public! Awesome idea. Looking forward to seeing how this technology works. Great interview. Some valuable info and insight here. AdPushup looks like it could be a really cool tool, signed up for the beta already.